In the EcoYoga world often 'going green' is associated with a whole slew of health-related changes meant to be your body back to it's "natural" state. It's easy to get caught up in the whole "modern=evil" paradigm that so often permeates the environmental culture. Our world is going to crap due to pollution, which is caused by humans and technology. Therefore, technology and thus anything modern must be bad for us. The Paleolithic Diet is one such example. Firstly, I think it's important to clarify that eating 'Paleo' is a diet. And like any diet, it has severe restrictions that often aren't realistic as a permanent dietary lifestyle. "Diets" don't work, I am a firm believer in this statement and feel that it is more important to strive for balance and acceptance. There is a lot of evidence out there that also point out the problems with "dieting" and cyclical food restrictions. 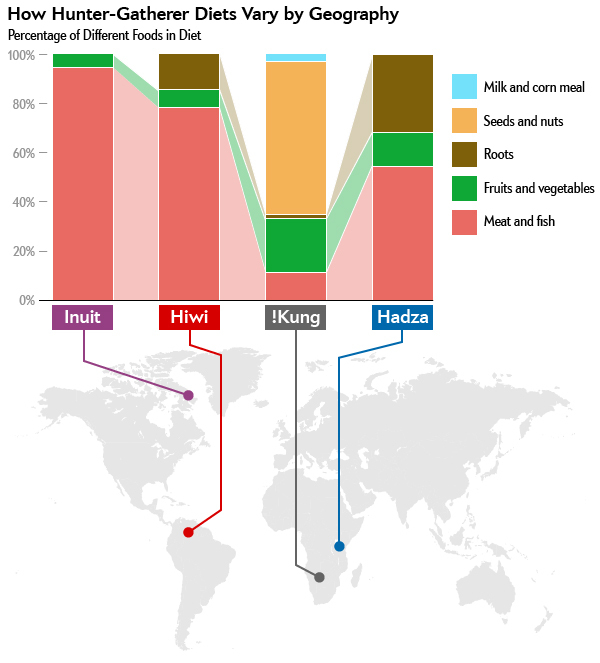 The paleolithic diet (abbreviated paleo diet or paleodiet), also popularly referred to as the caveman diet, Stone Age diet and hunter-gatherer diet, is a modern nutritional plan based on the presumed ancient diet of wild plants and animals that various hominid species habitually consumed during the Paleolithic era—a period of about 2.5 million years which ended around 10,000 years ago with the development of agriculture and grain-based diets. In common usage, the term "paleolithic diet" can also refer to actual ancestral human diets, insofar as these can be reconstructed. Centered on commonly available modern foods, the contemporary "Paleolithic diet" consists mainly of fish, grass-fed pasture raised meats, eggs, vegetables, fruit, fungi, roots, and nuts, and excludes grains, legumes, dairy products, potatoes, refined salt, refined sugar, and processed oils (Wikipedia). Above and beyond this definition, many versions include fasting between meals (like hunter gatherers did) and practicing extreme physical exercise... as if hunting and chasing big game, prior to eating. Check out this NYTimes article on a group of Paleo dieters in NY. I am certainly a fan of eating more fruits, vegetables and avoiding processed foods and refined sugars. That's not my problem with this "diet". What I think is really interesting, is the (in my mind) extreme reaction of anti-modernity and nostalgic assumptions of the "good ole times"... of 10,000 years ago. In an extremely well-written article on the history of the Paleolithic Diet, the author of this blog points to a more larger cultural reaction that has been happening since the early 1900's reacting against modernity and fantasizing "back to nature" wilderness human living. Yes, modern humans are having difficulty with eating healthy and living well... but that does not necessarily mean that paleolitic humans were living all that well either. I wouldn't necessarily point to the invention of agriculture as the culprit for unhealthy living. Humans had a significantly lower lifespan and we're not quite clear from archeological records what the main causes of death could have been (ie diseases from nutrient deficient diets... like never eating whole grains, legumes or low fat dairy). There has been some recent evidence that humans during that time period did in fact have atherosclerosis (arteries clogged with cholesterol and fat). I find it difficult when a proponent of the diet makes sweeping claims that eating habits (and implying lifestyle) was 'better' 10,000 years ago based of evolutionary "science". Evolutionary "science" also claims that women go through menopause because we were never meant to live or have a biological (and read: usefulness in society) purpose beyond child rearing... most women (and men) never lived beyond the decades of menopause. (ps, if you haven't guessed from my tone, I believe this is a load of huey- and there's some interesting alternatives theories to support women's role beyond menopause). Ok, say you're wanting to use the Paleolithic diet as a "guideline" in healthy eating. Fine... but do you know what region of the world you'd like to emulate? Cuz each season and region would be different in types and amounts of food eaten. We also have almost no idea the ratio of fruits to vegetables that paleolithic humans ate in their diets. (Read this Scientific American article for a point-by-point debate on the Paleo Diet). Like all things green, and all things eating and health related, I am a huge proponent of moderation and realistic expectations. Perhaps instead of constantly fixating on elaborate fads, trends or changes, we need to take a step back and strive for Balance. My biggest issue with the Paleo diet is how meat heavy it is. Meat is such a carbon and water intensive food that, if we are concerned about climate change or habitat loss, needs to be eaten in small portions or not at all. Folks I know who are Paleo usually opt for grass fed and such but I still think that a meat-less or meat-light diet is better for the planet and our bodies. @Alice: great point! And another reason why a balanced approach (ie, less meat) is better than something so restrictive. Also- what is interesting is that grass fed meat is expensive. So if you're trying paleo AND sticking to grass fed meat- that can get expensive= which implies that only those who can afford it could do this diet. 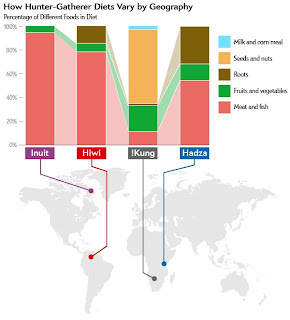 That graphic of hunter-gatherer diets is fascinating! I'm a believer in all things in moderation. Well, not all things. I don't drink coffee or alcohol, but as far as grains, fruits, veggies, meat goes -- moderation. I mostly find the paleo movement interesting for some of the reasons you discuss here -- b/c it seems to idolize and oversimplify the past in an extremely nostalgic way. It is useful to think about what our bodies evolved to eat and what foods are best suited to health, and I can see how a diet like paleo would come about as an extreme backlash to modern processed eating and a desire to get back to some elusive "original" diet. Always so sad to see misinformation repeated and distributed. You are correct in that Paleo is a diet, but not the kind you may think. Paleo is a lifestyle, it involves eliminating (no moderation in this respect) processed foods of all kinds and instead eating vegetables, fruits, health fats, nuts, meat and full-fat dairy if you can tolerate it. Doesn't sound that bad or restrictive to me. It's about eating real food and minimizing sugar (ie. grains). There are even vegetarian Paleo eaters. Another extremely positive aspect of Paleo is its flexibility and focus on long-term maintenance. It promotes an 80-20 idea, which means different things to different people, but the gist is to choose Paleo eating 80% of the time and leave 20% for what life throws at you (weddings, bbqs, pub night) without guilt! The whole nostalgia/caveman issue is a dead one. Paleo is based on the science of food (digestibility and nutrient density) not the science of pre-history. Paleo is a permanent lifestyle not a fad diet. The real fad in question is calling Paleo a fad. Please refrain from discussing something of which it is painfully evident that you have only lightly researched one side of the story. Please read this rebuttal to Christina Warriner's talk. I hope you'll keep an open mind, especially as you don't seem to be particularly militantly anti-Paleo. In fact it's a diet (def: the kind of food that a person habitually eats) that I think is undeniably good, well-balanced and healthy. Hi, there! This post really shed some light on the paleo-craze and caught my attention because my boyfriend is experimenting with a Paleo diet. He claims to feel a lot better, less weighed down, etc., but we both have also tried veganism, which had the same results. I am of the belief that 'everything in moderation' is the way to live-- but, on the other hand, I do believe that we should limit some things more than others (more veggies never = bad!!!). I agree with Alice- this meat-laden paleo trend is not feasible in today's world (7 billion+ people, and the goliath meat industry atrociously impacting health, environment, world hunger issues). 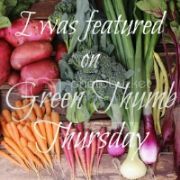 If you're interested in my attempts at a zero-waste lifestyle, visit my blog at http://talktrashytome.blogspot.com.